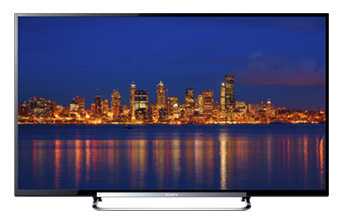 The Sony KDL-60R550A 60 inch is Sony's newest value offering for 2013 and early 2014. Sony went with larger size screens with its 2013 offerings as that trend has been hot with consumers. Though this is not a direct replacement model for last year, it's the 3rd tier quality and feature-wise in Sony's 2013 and early 2014 lineup. This is the first year Sony has produced passive 3D TVs, which with the KDL60R550A includes 4 pairs of 3D glasses. It has built in Wifi, Smart TV options, USB playback. The TV is also RVU ready for DirecTV and MHL ready for screen mirroring NFC smart devices. It has a more economical matte screen finish than the top models. One note about black level depth on the KDL-60R550A is that they look jet black on the top and bottom bars in a 16:9 format mode when directly viewed front and center. However colors can be a little more washed out on the picture itself due in part to the anti reflective coating on the screen of the R550A. Sometimes dark shadow detail could be better in the KDL-60R550A as the screen filter (matte screen) on this TV causes a hazy appearance with some programming on the screen. One quick fix is to turn up the Brightness setting some. This will cause better definition in dark areas but at the expense of less penetrating blacks. A very good comparison for the KDL-60R550A is Sharp line with which Sony is trying to take some market share. The 60R550A sells for around $1498 putting it very nicely in a value-plus area in the price per square inch category. It has a reasonable feature set to go along with the size and we particularly like the passive 3D. The Sharp LC-60LE757U and Samsung UN60F6400 are good comparisons.